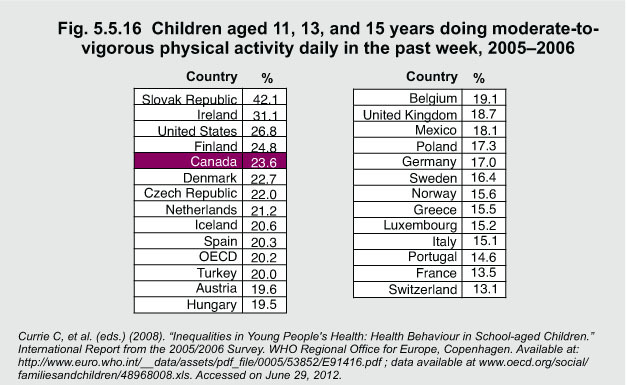 For 2005–06, compared to other OECD* countries, Canada’s school-aged children — aged 11, 13, and 15 years — rank fairly well with regards to their level of physical activity. For example, only 13.1% of children aged 11 to 15 years participate in moderate-to-vigorous physical activity per week in Switzerland, whereas in Canada the rate is almost double that number (23.6%). *OECD (Organisation for Economic Co-operation and Development) is an organization that acts as a meeting ground for 30 countries that believe strongly in the free market system. 1Currie C, et al. (eds.) (2008). “Inequalities in Young People’s Health: Health Behaviour in School-aged Children.” International Report from the 2005/2006 Survey. WHO Regional Office for Europe, Copenhagen. Available at: http://www.euro.who.int/__data/assets/pdf_file/0005/53852/E91416.pdf – accessed on June 29, 2012.